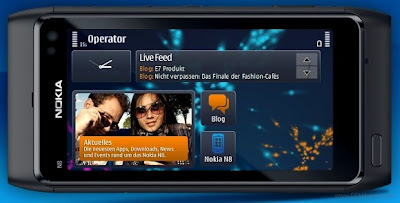 Some images posted on the Nokia Germany website just lifted the curtain on one of the features to come in the next Symbian^3 update. What we are seeing is the free-form widgets that were initially rumored to come with the PR 2.0 Anna update, but apparently didn’t make it. Until now the Symbian^3 widgets had a fixed size and you could only fit a preset number of them on the screen. However when free-form widgets become available you’ll be able to reduce those you need less often in size to make room for the more important ones. Now there’s an outside chance that someone in the Nokia Germany PR department just went too creative on those images, but we really doubt that this is the case. After all, what would be the point in simulating such a minor feature if you don’t plan on ever releasing. It won’t attract any new customers and it might earn you some bad publicity. So it’s a pretty safe bet that Symbian users will be able to resize their widgets once the next update becomes available. Dubbed PR 3.0 Belle, this upcoming update is expected to hit in the fall, but given that we’re still waiting for the mass availability of the Anna PR 2.0.